Enjoyed our stay. Beautiful Cabin. Go Dawgs! Your house is just what we needed for the holidays! It is absolutely beautiful and quiet. We will be back! Thanks again! Our family's first trip to Bryson City! Enjoyed our ride on the Polar Express and especially this wonderful cabin. The grandkids loved exploring the yard and the location was perfect. Merry Christmas! Thanks! Perfect cabin! Really enjoyed the layout of the entire property and easy access to the Polar Express. Will be back! Gorgeous cabin! Love the view! My brothers and their families and my family get together here in the mountains every year. We would love to come back. Love the dcor and so cozy. Thank you for letting us stay here. The house was beautiful! There was plenty of space for our large crowd, the bedrooms were large and the sleeping arrangements afforded everyone comfortable and quiet sleeping. The layout of the home was great for our family. Plenty of bathrooms and bathroom space. The view was extraordinary overlooking the mountains and the fire pit was the hit of each night for enjoying the sunset! And the hot tub was enjoyed by all! We all enjoyed our wonderful, fun filled although too short, stay! Our family has been coming to the mountains (Boone and Blowing Rock) for years. This is our first stay in the Great Smoky Mountains. Out of all the cabins we have stayed in, this has been the most beautiful and warm! We absolutely love the personal touches. This cabin is definitely a come back. Thanks! "I arrived last night. I love the place!" - Benjamin "I saw waterfalls and tons of rapids. I also did a two hour hike. I was really tired!" - Bella Your cabin was exactly what we needed. We celebrate our birthdays each September and we always have a memorable trip. Your nice cabin gave us some great memories we will never forget. Love, love the fire pit and the warmth and coziness we felt as we celebrated this year! We brought Mom and Dad for their 60th Wedding Anniversary. Awesome cabin. Spectacular views. Great trip. Great Time. We love it! Awesome cabin. Love the town! Very peaceful and quiet. The cabin is perfect. Love the view. We have everything we need. It is beautiful. After kayaking we spent a lovely afternoon relaxing in the porch. We will be back! We had a wonderful vacation. We love Bryson City. :) This is our fourth year in a row. Love the house. We have had a wonderful vacation! 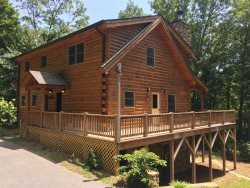 You have a beautiful cabin and we enjoyed our relaxing getaway. We love the porch and the ever-changing view. Thank you so much for sharing your beautiful home! It was absolutely perfect! We had a wonderful time. We look forward to our next visit. Great home. Great view. We love Bryson City!